Sometimes I find myself stuck creatively but still want to create. 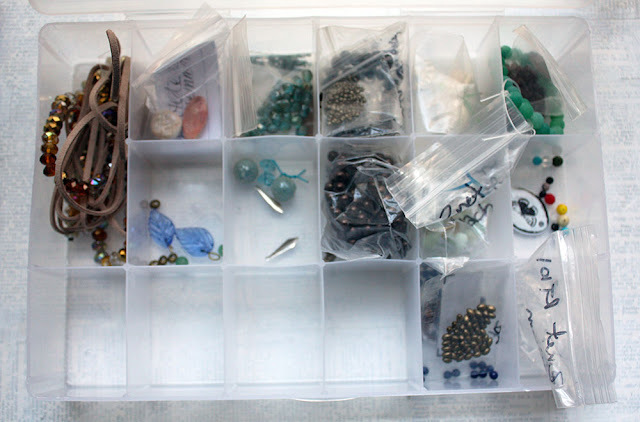 I've tried all kinds of methods to alleviate this conundrum, but the one that seems to be working for me the best right now is my Bead Box. I set up the first one back in October in preparation for sitting in a waiting room. but worked on it over the course of a couple of months to reveal the jewelry made in December. Basically, it's a craft tackle box. 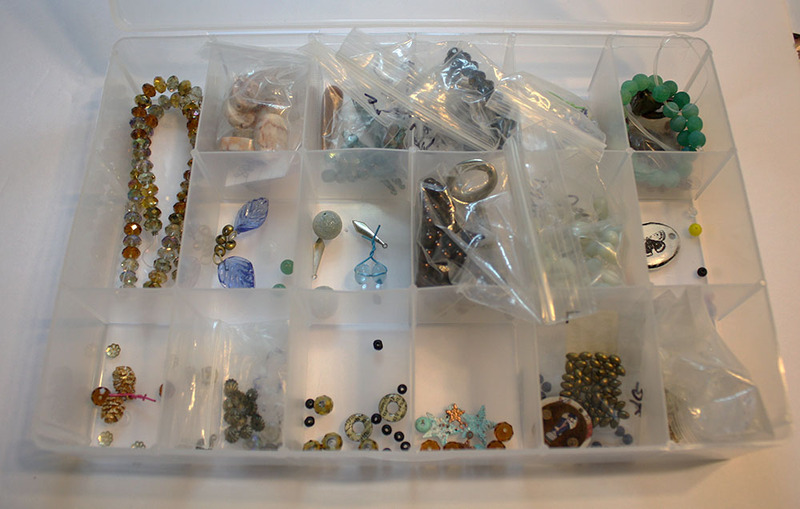 Into each compartment, I'm putting the beads/elements for a single design. Basically, I design ahead of time and create when time permits. Since it worked so well for me before, I decided to restock the box. Again, I dipped into my Inspiration Jar to get the ball rolling. I'm sure you notice that not every compartment is full. It was actually even less full than this as I had gotten frustrated with designing and had to stop. But, a couple other ideas came to me and got tossed in before I took the pictures. Want a better look at what's in the box? 1: Chinese crystals from ZnetShows.com, a bullet casing (with a hole through it), and a long length of suede cord. 2: Marbled stone beads and two beads from Spirited Earth by Nan Emmett (as received in last year's Swap N Hop). 3: Polymer clay teardrops from a mixed bag from Tree Wings Studio, long bead caps (from Michael's I believe), and a few lovey Czech glass beads. 4: Brass-colored glass seed beads, a small brass connector, and Chinese crystals from ZnetShows.com. 5: Bird charms I altered with the Vintaj BigKick and alcohol inks and a couple of large plastic off-white beads salvaged from old jewelry. 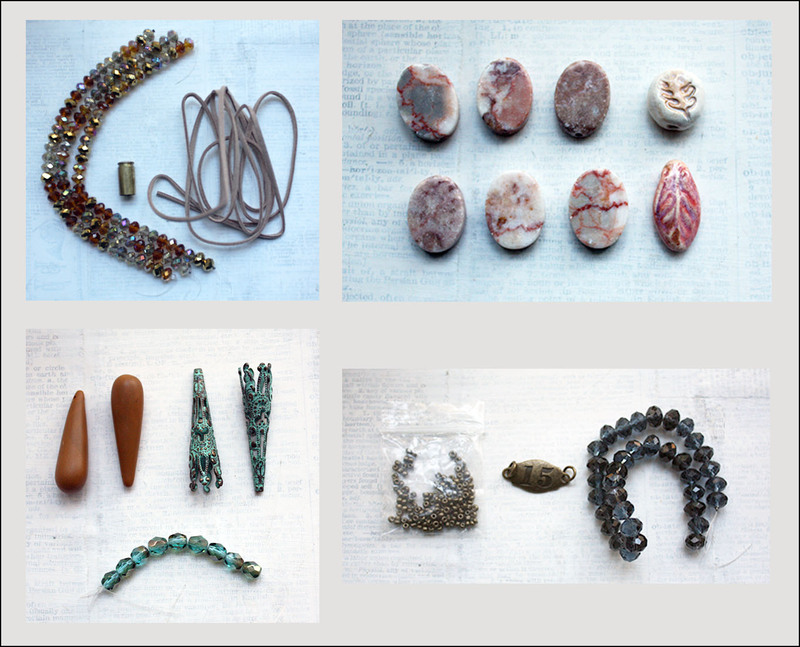 6: A found, smashed washer with a nice patina on it, a diamond-shaped ceramic bead from Gaea, green-dyed fire agate from ZnetShows.com, and salvaged brown glass beads. 7: Salvaged blue glass leaves, jade beads, and brass beads. 9: A skeleton key and brown glass pearls. 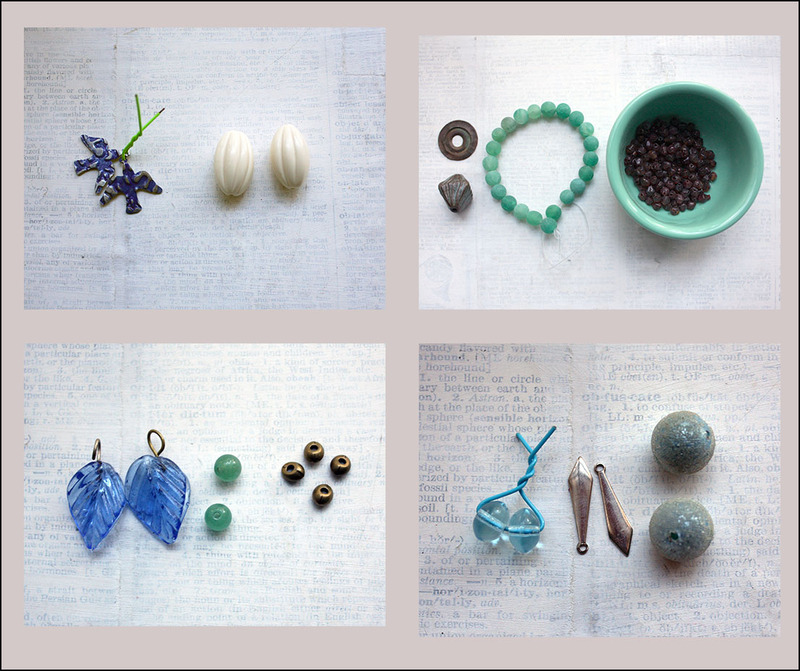 10: Mother of pearl buttons and amazonite briolettes. 11: A paper-crafting tag that I altered by stamping on a butterfly and sealing it, and a variety of glass and stone beads. 12: A nifty little piece I made with an old keyhole and some tin riveted together, brass beads from ZnetShows.com, and dark blue stone beads. 13: A key altered with the addition of a salvaged rhinestone piece and clear Chinese crystals from (guess where) ZnetShows.com. As you can see, that's where I stopped with no intention of filling up the rest of the box. However, once I made the first piece (with the crystals, bullet casing, and leather), I had a few of the crystals loose and leftover. I didn't really want to bag them up, so I came up with more designs to fill up the rest of the box! I got that done late yesterday afternoon and the lighting wasn't great, but I took pictures anyway. Sorry for their poorness. Also, I numbered these all crazy-like because of where I had stopped and re-started filling the box. I'm all over the place and hope you don't mind too much. 14: I'm not completely sold on this design. I shared these on Instagram yesterday as I was laying them out on my desk. A friend suggested a different design incorporating those little pinecones. I'm letting it marinate for now. In the meantime; those are gold pinecone charms, Chinese crystals, and gold-tone bead caps. 15: Salvaged connectors with rhinestones, Chinese crystals, and brass bead caps. 16: Washers I made ages ago that are embellished with dictionary text embedded in resin (I call them wordy washers), Chinese crystals, and black tagua nut beads. 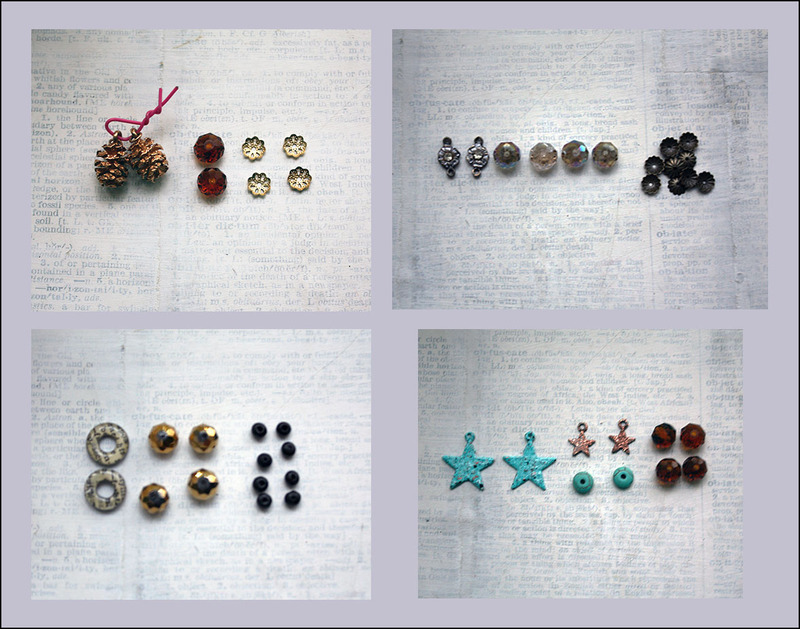 17: Salvaged star charms (altered with Iced Enamels), turquoise disc beads, and Chinese crystals. Now I just need to pull them all together and get some jewelry made! This method of designing when I feel inspired and making when I don't seems to be working out pretty well for me at the moment. What's your design process like? 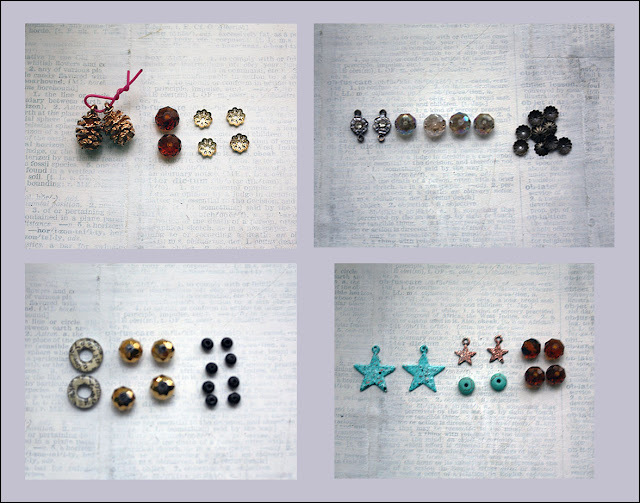 I love the wordy washers and the stars with the iced enamels. I am so inspired by just looking at the photos.. Have fun! I'm Keeping my eye on 10, 14, 16, & 17 ~ they excite me the most!!! You will do something wonderful with each and every compartment ~ you always do! ooh, this is an interesting idea! 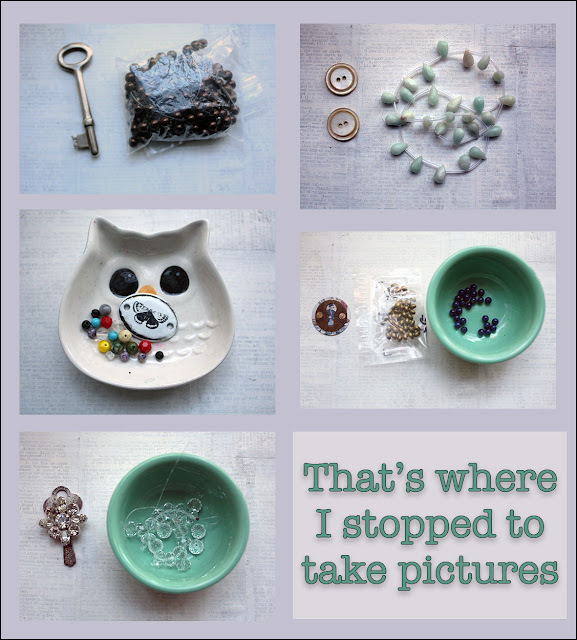 I've tried that and it somehow didn't work for me but you're so organized, I've said that before :) But at least I started putting things for a single design in zip lock bags and keep them in a ceramic pot on my working table, so that I can use them anytime.